“Once, during Prohibition,” says W.C. Fields, “I was forced to live for days on nothing but food and water.” Prohibition may have been launched by the Temperance movement, but make no mistake, Prohibition is not Temperance. Temperance is ideal balance. “Whereon he thought of himself in balance,” say the Moody Blues, “and he knew he was.” Those of you who read my posting regarding the three black major cards may have noticed they are numbered 13, 15 and 16. The card following Death, 14, is not at all black, rather here we see a bright angel poised with one foot on land and one foot in the water in perfect balance. How and why is this achieved? It is something like Osiris crossing the river Styx before he reaches the Underworld, a necessary and somewhat peaceful part of the journey into darkness. Here we find a great deal of light, a crown on the Angel’s head and a matching crown on the distant peak. Water flows economically from one vessel to the other. All seems idyllic. This idyll is reached only after Temperance is a reality, and a person learns temperance only with experience, as a sword is tempered only with extreme heat and pressure. 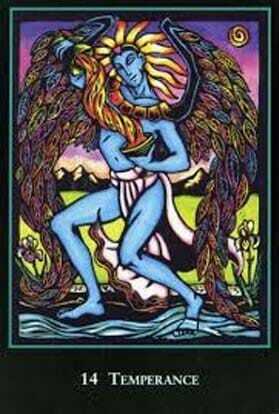 Temperance is necessary in order to keep yourself in balance, to keep your cool under stress as the sharp blade keeps its edge under harsh use, and we know harsh use is to come. 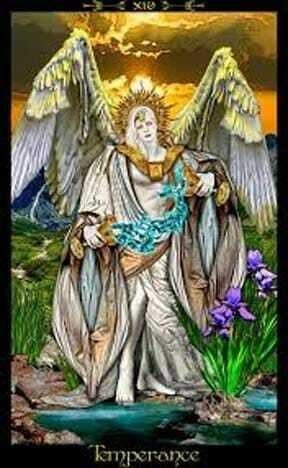 Temperance is the enlightened balance that comes in the midst of the black major cards. To achieve it, we need external impetus as well as internal fortitude, and then the catalytic experience of total transformation. We can go forward with this internal glow to guide us through dark times to come because it is an Enlightenment, whereon we know ourselves to be in balance. 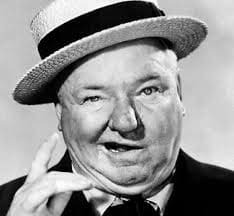 The photograph is of W.C. Fields and is unattributed. The cards 13 – 16 are from the Waite Smith deck. 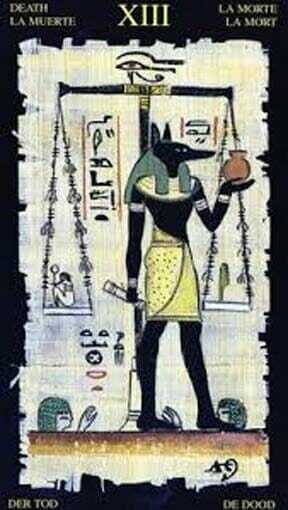 The Death card is from the Egyptian Tarot deck. The first Temperence card is from the World Spirit deck. 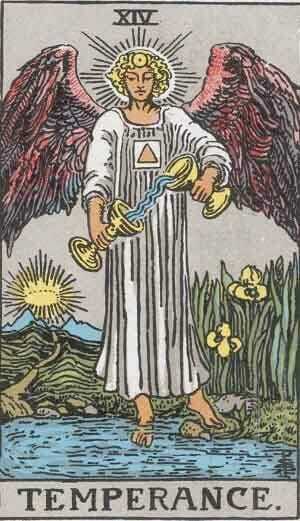 The second Temperance card is from the Tarot Illuminati deck.